This Premiere Classe Hotel is located 20 km south of Paris in Chilly-Mazarin, close to the A10 and A6 motorways. It offers affordable accommodation with free Wi-Fi internet access. 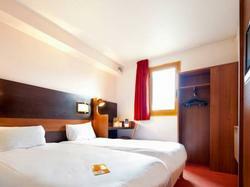 Each of the guest rooms is equipped with a private bathroom and a TV with satellite channels (Canal +). Premiere Classe Chilly Mazarin serves a daily continental breakfast. It also provides a 24-hour front desk and a night porter. The hotel has free private parking for guests arriving by car. The Longjumeau RER train station is 1 km from Premiere Classe Chilly Mazarin providing access to the capital. The reception is open from 06:30 until 11:00 and 17:00 to 21:00 on weekdays, and from 07:00 until 11:00 and from 17:00 until 21:00 on weekends and public holidays. If you plan on arriving outside the opening hours, please contact the hotel directly. The phone number is indicated on the confirmation of reservation. En suite room with a shower and flat-screen TV.